Elizabeth Loerchner has had years of training and absorbed much from her mentor. It is quite unbelievable how masterly her few knives have turned out. She has thought long and hard about a knifemaking career and is now so committed and enthralled with the profession that she will be doing it for many years to come. Keep your eye on this gal, as I am convinced history will repeat itself. Her use of files to get the proper curves in a tapered manner is representative of her finesse. Her two Damascus inlays (forged by Brian Lyttle and Bertie Rietveld) are of different textures, but very complementary. Handle material of 440 SS, carved and inlayed Damascus tear drops, Nickel Damascus by Brian Lyttle and stainless Damascus by Bertie Rietveld. The grinds are spot on. 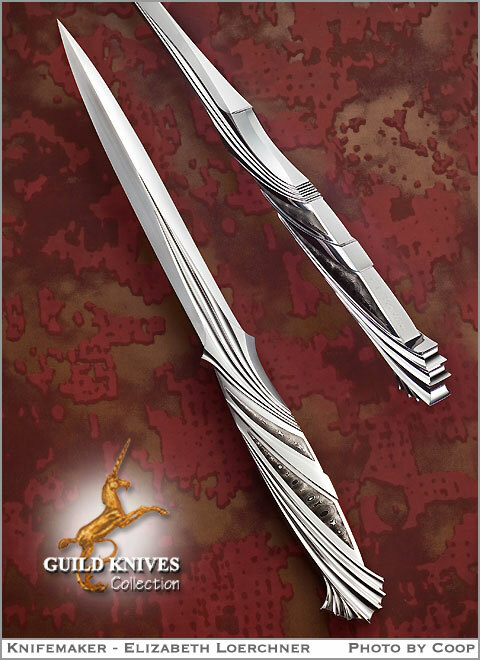 Elizabeth named this dagger: Lyrid.